From the lush, green, rugged north; to the pristine beaches along the Mediterranean coast; to the sun-drenched olive groves of the south, Spain's fascinating geography means you'll never have the same experience twice. Just as each of its most iconic cities have a unique feel to them, the different regions of Spain all offer something completely original. This large map of Spain will help you figure out how to make your way around the country. If your vacation plans include a full tour of the Iberian Peninsula, no worries—we've also included Portugal. Find the grid reference for the part of the map that you want to see and scroll down to the corresponding number in the list below to see a more detailed image of that part of the map. 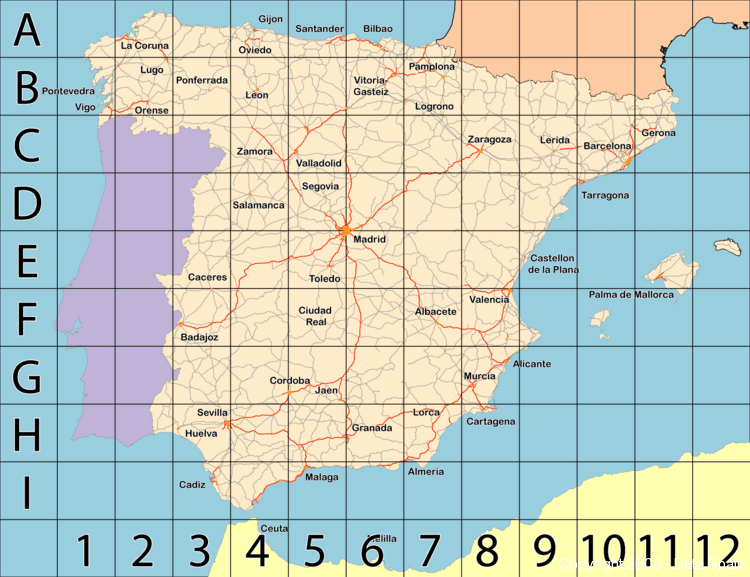 See more maps of Spain below or buy a map of Spain. Continue to 2 of 84 below. Continue to 3 of 84 below. Continue to 4 of 84 below. Continue to 5 of 84 below. Continue to 6 of 84 below. Continue to 7 of 84 below. Continue to 8 of 84 below. Continue to 9 of 84 below. Continue to 10 of 84 below. Continue to 11 of 84 below. Continue to 12 of 84 below. Continue to 13 of 84 below. Continue to 14 of 84 below. Continue to 15 of 84 below. Continue to 16 of 84 below. Continue to 17 of 84 below. Continue to 18 of 84 below. Continue to 19 of 84 below. Continue to 20 of 84 below. Continue to 21 of 84 below. Continue to 22 of 84 below. Continue to 23 of 84 below. Continue to 24 of 84 below. Continue to 25 of 84 below. Continue to 26 of 84 below. Continue to 27 of 84 below. Continue to 28 of 84 below. Continue to 29 of 84 below. Continue to 30 of 84 below. Continue to 31 of 84 below. Continue to 32 of 84 below. Continue to 33 of 84 below. Continue to 34 of 84 below. Continue to 35 of 84 below. Continue to 36 of 84 below. Continue to 37 of 84 below. Continue to 38 of 84 below. Continue to 39 of 84 below. Continue to 40 of 84 below. Continue to 41 of 84 below. Continue to 42 of 84 below. Continue to 43 of 84 below. Continue to 44 of 84 below. Continue to 45 of 84 below. Continue to 46 of 84 below. Continue to 47 of 84 below. Continue to 48 of 84 below. Continue to 49 of 84 below. Continue to 50 of 84 below. Continue to 51 of 84 below. Continue to 52 of 84 below. Continue to 53 of 84 below. Continue to 54 of 84 below. Continue to 55 of 84 below. Continue to 56 of 84 below. Continue to 57 of 84 below. Continue to 58 of 84 below. Continue to 59 of 84 below. Continue to 60 of 84 below. Continue to 61 of 84 below. Continue to 62 of 84 below. Continue to 63 of 84 below. Continue to 64 of 84 below. Continue to 65 of 84 below. Continue to 66 of 84 below. Continue to 67 of 84 below. Continue to 68 of 84 below. Continue to 69 of 84 below. Continue to 70 of 84 below. Continue to 71 of 84 below. Continue to 72 of 84 below. Continue to 73 of 84 below. Continue to 74 of 84 below. Continue to 75 of 84 below. Continue to 76 of 84 below. Continue to 77 of 84 below. Continue to 78 of 84 below. Continue to 79 of 84 below. Continue to 80 of 84 below. Continue to 81 of 84 below. Continue to 82 of 84 below. Continue to 83 of 84 below. Continue to 84 of 84 below.